For other people named Betsy Ross, see Betsy Ross (disambiguation). "Elizabeth Claypoole" redirects here. For the second daughter of Oliver Cromwell, see Elizabeth Claypole. 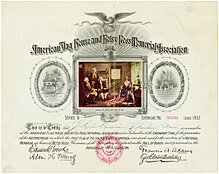 Certificate of the American Flag House and Betsy Ross Memorial Association, issued 1912; at left and right vignettes of the Betsy Ross House and with the then current grave site of Betsy Ross. Elizabeth Griscom Ross (January 1, 1752 – January 30, 1836), née Griscom, also known by her second and third married names, Ashburn and Claypoole, was an American upholsterer who has been credited in the past with making the first American flag. According to Ross family tradition, General George Washington, commander-in-chief of the Continental Army and two members of a congressional committee--Robert Morris and George Ross--visited Mrs. Ross in 1776. Mrs. Ross convinced George Washington to change the shape of the stars in a sketch of a flag he showed her from six-pointed to five-pointed by demonstrating that it was easier and speedier to cut the latter. However, there is no archival evidence or other recorded verbal tradition to substantiate this story of the first American flag. It appears that the story first surfaced in the writings of her grandson in the 1870s (a century after the fact), with no mention or documentation in earlier decades. Ross made flags for the Pennsylvania navy during the American Revolution. The flags of the Pennsylvania navy were overseen by the Pennsylvania Navy Board. The board reported to the Pennsylvania Provincial Assembly's Committee of Safety. In July 1775, the President of the Committee of Safety was Benjamin Franklin. Its members included Robert Morris and George Ross. At that time, the committee ordered the construction of gunboats that would eventually need flags as part of their equipment. As late as October 1776, Captain William Richards was still writing to the Committee or Council of Safety to request the design that he could use to order flags for their fleet. The Pennsylvania navy's ship colors included (1) an ensign; (2) a long, narrow pennant; and (3) a short, narrow pennant. The ensign was a blue flag with 13 stripes—seven red stripes and six white stripes in the flag's canton (upper-left-hand corner). It was flown from a pole at the rear of the ship. The long pennant had 13 vertical stripes near the mast; the rest was solid red. It flew from the top of the ship's mainmast, the center pole holding the sails. The short pennant was solid red, and flew from the top of the ship's mizzenmast—the pole holding the ship's sails nearest the stern (rear of the ship). Betsy Ross was born on January 1, 1752, to Samuel Griscom (1717–1793) and Rebecca James Griscom (1721–1793) in Philadelphia, Pennsylvania. Ross was the eighth of seventeen children, of whom only nine survived childhood. A sister, Sarah (1745–1747), and brother, William (1748–1749), died before Elizabeth ("Betsy") was born (another sister, Sarah Griscom Donaldson (1749–1785), was named after the earlier deceased Sarah). Ross was just five years old when her sister Martha (1754–1757) died, and another sister, Ann (1757–1759), only lived to the age of two. Brothers Samuel I (1753–1756) and Samuel II (1758–1761) both died at age three. Two others, twins, brother Joseph (1759–1762) and sister Abigail (1759–1762), died in one of the frequent smallpox epidemics in the autumn of 1762. Ross grew up in a household where the plain dress and strict discipline of the Quakers dominated. She learned to sew from a great aunt, Sarah Elizabeth Ann Griscom. Ross' great-grandfather, Andrew Griscom, a member of the Quakers and a carpenter, had emigrated in 1680 from England. After her schooling at a Quaker-run state school, Ross' father apprenticed her to an upholsterer named William Webster. At this job, she fell in love with fellow apprentice John Ross (nephew of George Ross Jr, signer of the United States Declaration of Independence), who was the son of the Rev. Aeneas Ross (and his wife Sarah Leach), a Church of England (later Episcopal) priest and assistant rector at the historic city parish of Christ Church. The couple eloped in 1773, marrying at Hugg's Tavern in Gloucester City, New Jersey. The marriage caused a split from her Griscom family and meant her expulsion from the Quaker congregation. The young couple soon started their own upholstery business and later joined Christ Church, where their fellow congregants occasionally included visiting colony of Virginia militia regimental commander, colonel, and soon-to-be-general George Washington (of the newly-organized Continental Army) and his family from their home Anglican parish of Christ Church in Alexandria, Virginia, near his Mount Vernon estate on the Potomac River, along with many other visiting notaries and delegates in future years to the soon-to-be-convened Continental Congress and the political/military leadership of the colonial rebellion. Betsy and John Ross had no children. The American Revolutionary War broke out when the Rosses had been married for two years. As a member of the local Pennsylvania Provincial Militia and its units from the city of Philadelphia, John Ross was assigned to guard munitions and, according to one legend, was killed by a gunpowder explosion, but family sources provide doubts about this claim. The 24-year-old Elizabeth ("Betsy") continued working in the upholstery business repairing uniforms and making tents, blankets, and stuffed paper tube cartridges with musket balls for prepared packaged ammunition in 1779 for the Continental Army. There is speculation that Ross was the "beautiful young widow" who distracted Carl von Donop in Mount Holly, New Jersey, after the Battle of Iron Works Hill, thus keeping his forces out of the crucial "turning-of-the-tide" Battle of Trenton on the morning of December 26, 1776, in which Hessian soldiers were defeated after the crossing of the Delaware River. On June 15, 1777, she married her second husband, mariner Joseph Ashburn. In 1780, Ashburn's ship was captured by a Royal Navy frigate and he was charged with treason (for being of British ancestry—naturalization to American colonial citizenship was not recognized) and imprisoned at Old Mill Prison in England. During this time, their first daughter, Zilla, died at the age of nine months and their second daughter, Eliza, was born. Ashburn died in the British jail. Three years later, in May 1783, she married John Claypoole, who had earlier met Joseph Ashburn in the English Old Mill Prison; Claypoole and had informed Ross of her husband's circumstances and death. The couple had additionally five daughters: Clarissa, Susanna, Jane, Rachel, and Harriet (who died in infancy). With the birth of their second daughter Susanna in 1786, they moved to a larger house on Philadelphia's Second Street, settling down to a peaceful post-war existence, as Philadelphia prospered as the temporary national capital (1790–1800) of the newly independent United States of America, with the first president, George Washington, his vice president, John Adams, and the convening members of the new federal government and the U.S. Congress. In 1793, her mother, father, and sister Deborah Griscom Bolton (1743–1793) all died in another severe yellow fever epidemic (a disease unknowingly caused by infected mosquitoes that in those times ranged farther north from the subtropical zones of the southern U.S.). After two decades of poor health, John Claypoole died in 1817. Ross continued the upholstery business for 10 more years. Upon retirement, she moved in with her second Claypoole daughter, Susanna (1786–1875), in a section of Abington Township, Montgomery County, Pennsylvania. Her eldest Claypoole daughter, Clarissa (1785–1864), had taken over Ross' business back in the city. Ross, by then completely blind, spent her last three years living with her middle Claypoole daughter, Jane (1792–1873), in rapidly growing and industrializing Philadelphia. On Saturday, January 30, 1836, 60 years after the Declaration of Independence, Betsy Ross died at the age of 84. She was survived by five daughters with John Claypoole: Eliza, Clarissa, Susanna, Jane, and Rachel, and one sister, Hannah Griscom Levering (1755–1836), who herself died about 11 months later. Although it is one of the most visited tourist sites in the city of Philadelphia, the claim that Ross once lived at the so-called "Betsy Ross House" is still a matter of historical academic dispute. Betsy Ross's body was first interred at the Free Quaker burial grounds on North Fifth Street in Philadelphia. Twenty years later, her remains were moved to the Mt. Moriah Cemetery in Philadelphia. In 1975, in preparation for the American Bicentennial, city leaders ordered the remains moved to the courtyard of the Betsy Ross House. However, cemetery workers found no remains beneath her tombstone. Bones found elsewhere in the family plot were deemed to be hers and were reinterred in the current grave visited by tourists at the Betsy Ross House. On January 1, 1952, the U.S. Post Office issued a commemorative postage stamp to honor the 200th anniversary of her birth. It shows her presenting the new 13-striped, 13-starred flag to George Washington, with Robert Morris, and George Ross present. The design was taken from a painting by Charles H. Weisberger, one of the founders and first custodian of the Memorial Association, who has cared for and operated the Ross House. This was issued when the Ross legend was still strong and accepted by many of the American public before additional historical and academic scrutiny had been enacted. Research conducted by the National Museum of American History of the Smithsonian Institution in Washington, D.C. notes that the story of Betsy Ross making the first American flag for General George Washington entered into American consciousness about the time of the 1876 centennial celebrations, with the Centennial Exposition then scheduled to be held in Philadelphia. 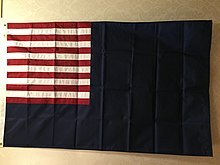 In 1870, Ross's grandson, William J. Canby, presented a research paper to the Historical Society of Pennsylvania in which he claimed that his grandmother had "made with her hands the first flag" of the United States. Canby said he first obtained this information from his aunt Clarissa Sydney (Claypoole) Wilson in 1857, 20 years after Ross' death. Canby dates the historic episode based on Washington's journey to Philadelphia, in the late spring of 1776, a year before the Second Continental Congress passed the first Flag Act of June 14, 1777. In the 2008 book The Star-Spangled Banner: the Making of an American Icon, Smithsonian Institution experts point out that Canby's recounting of the event appealed to patriotic Americans then eager for stories about the Revolution and its heroes and heroines. Betsy Ross was promoted as a patriotic role model for young girls and a symbol of women's contributions to American history. American historian Laurel Thatcher Ulrich further explored this line of enquiry in a 2007 article, "How Betsy Ross Became Famous: Oral Tradition, Nationalism, and the Invention of History". Ross was merely one of several flag makers in Philadelphia (such as Rebecca Young, who is historically documented to have made the earlier Grand Union Flag of 1775–76, with the British Union Jack of the crosses of St. George and St. Andrew, in the upper corner canton and 13 alternating red and white stripes for the "United Colonies") for the Continental Army, along with many other ships' colors, banners, and flags which were advertised in local newspapers. Rebecca Young's daughter Mary Young Pickersgill (1776–1857) made the flag of 15 stars and stripes in 1813, begun at her house and finished on the floor of a nearby brewery, delivered to the commander of the fort the year before the British attack of September 12–14, 1814, on Fort McHenry in Baltimore, during the War of 1812, (receiving a government-issued receipt for the work of two flags, a large 30 by 42 foot (9.1 by 12.8 m) "garrison flag" and a smaller "storm flag"), then seen by Francis Scott Key (1779–1843) and which inspired him to write the poem which later became the national anthem, The Star-Spangled Banner. Pickersgill's small 1793 rowhouse is still preserved in East Baltimore's Old Town neighborhood at East Pratt and Albemarle Streets and is known as the "Flag House & Star-Spangled Banner Museum". Occasionally over the decades, there has been some controversy and disagreement between the relative merits and historical accuracies of the two flag-making traditions and historical sites in Philadelphia and Baltimore. It is thought that Ross' only contribution to the flag design was to change the 6-pointed stars to the easier 5-pointed stars. Scholars, however, accept the claim by Francis Hopkinson—a member of the Continental Congress who designed most of the elements of the Great Seal of the United States—that he created designs for the early American flag. Hopkinson submitted letters to Congress in 1780 requesting payment for his designs. Hopkinson was the only person to make such a claim in the Revolutionary War era. Despite the accuracy or not of the historical legend, the Betsy Ross Bridge, connecting Philadelphia with Pennsauken Township, New Jersey, across the Delaware River is named in her honor. ^ Balderston, Lloyd (1917). The Evolution of the American Flag. Philadelphia: Ferris and Leach. ^ Marc Leepson, "Five myths about the American flag" Archived 2017-07-15 at the Wayback Machine, The Washington Post, June 12, 2011, p. B2. ^ Furlong, William Rea; McCandless, Byron (1981). So Proudly We Hail: The History of the United States Flag. Washington, D.C.: Smithsonian Institution Press. p. 117. ^ Richardson, Edward W. (1982). Standards and Colors of the American Revolution. University of Pennsylvania Press. pp. 111–112. ^ Miller, Marla R (2010). Betsy Ross and the Making of America. New York, NY: Henry Holt and Company. pp. 244–245, Illustration 10. ^ Moeller, Henry W. (January 2002). "Two Early American Ensigns on the Pennsylvania State Arms". NAVA News (173): 2. ^ a b Kashatus, William C. ushistory.org, June 2005, "Seamstress for a Revolution Archived September 18, 2009, at the Wayback Machine". Accessed 2 February 2010. ^ Marla Miller, Betsy Ross and the Making of America, p. 45. ^ a b c d e f "Betsy Ross: Her Life". ushistory.org. Independence Hall Association. Archived from the original on 13 October 2014. Retrieved 17 October 2014. ^ a b c William C. Kashatus, "Seamstress for a Revolution", in American History, vol. 37.3 (August 2002). ^ Laurel Thatcher Ulrich (May 7, 2010). "Book Review — Betsy Ross and the Making of America — By Marla R. Miller — NYTimes.com". The New York Times. Archived from the original on November 14, 2013. Retrieved February 6, 2011. ^ Fischer, David Hackett (2004). Washington's Crossing. New York: Oxford University Press. ISBN 0-19-517034-2. ^ Miller, Marla R. Betsy Ross and the Making of America, p 342. Macmillan, pub. 2010. ^ Andrew Carr, "The Betsy Ross House", American History, vol. 37.3, (August 2002): 23. ^ "Was This Her House?" Archived February 15, 2006, at the Wayback Machine at UShistory.org. ^ Buescher, John. "All Wrapped up in the Flag" Archived 2011-09-23 at the Wayback Machine Teachinghistory.org Archived 2011-07-11 at the Wayback Machine, accessed August 21, 2011. ^ What About Betsy Ross, pp. 68–69. ^ Williams, Jr., Earl P. (October 2012). "Did Francis Hopkinson Design Two Flags?" (PDF). NAVA News (216): 7–9. Archived (PDF) from the original on 9 February 2017. Retrieved 16 February 2017. ^ Williams (2012), pp. 7–9. "Betsy Ross Issue". Smithsonian National Postal Museum. Retrieved May 29, 2014. Chanko, Pamela. Easy Reader Biographies: Betsy Ross: The Story of Our Flag (Easy Reader Biographies). 2007. Cohon, Rhody, Stacia Deutsch, and Guy Francis. Betsy Ross' Star (Blast to the Past). 2007. Cox, Vicki. Betsy Ross: A Flag For A Brand New Nation (Leaders of the American Revolution). 2005. Harker, John B. and Museum Images & Exhibits. Betsy Ross's Five Pointed Star. 2005. Harkins, Susan Sales and William H. Harkins. Betsy Ross (Profiles in American History) (Profiles in American History). 2006. Leepson, Marc. Flag: An American Biography (Thomas Dunne Books/St. Martin's Press, 2005). Mader, Jan. Betsy Ross (First Biographies). 2007. Mara, Wil. Betsy Ross (Rookie Biographies). 2006. Wikimedia Commons has media related to Betsy Ross. "Betsy Ross". Find a Grave. Retrieved August 11, 2010.